Killing Joke live at the Lyceum in London on 29 February 1980, was a classic gig by all accounts and the entire concert has surfaced on YouTube, although it’s audio only. The sound is a bit rough and ready, but there’s plenty of bass and loads of energy. 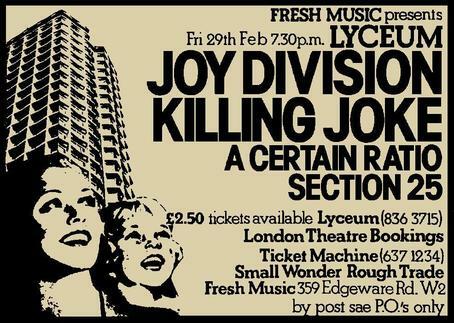 This was a co-headline gig which Killing Joke shared with Joy Division, for £2,50, and you also got to see A Certain Ratio and Section 25.